When cold weather hits, feral cats suffer—and unfortunately there are just too many feral cats for all of them to find safe, warm forever homes. 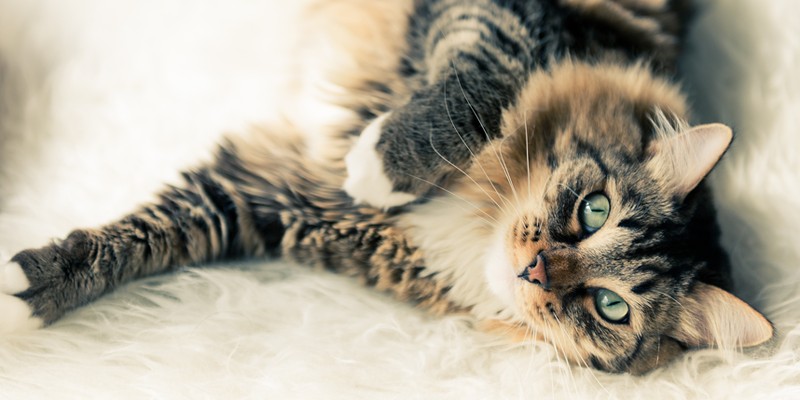 Spaying, neutering, and cat adoption are critical to solving the problem long term, but many cat lovers take the extra step of buying or building outdoor winter shelters for the feral cats in their neighborhood. Check out these winter shelters for feral cats, and get inspired to make a homeless cat’s life more comfortable and safe this winter. The folks at Bushwick Street Cats help further their mission to serve the feral cat population by teaching people how to make winter shelters out of a plastic storage bin and a flowerpot. Check out the DIY instructions. For very cold conditions, Neighborhood Cats has a DIY guide to create an ultra-warm shelter out of Styrofoam and linoleum tiles. Latex deck paint makes it cheerful-looking while sealing out the elements. See how to make one. Not the DIY type? 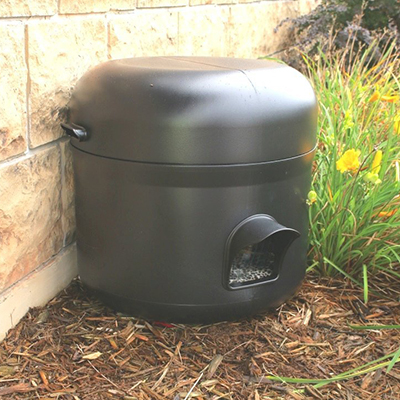 You can still help feral cats stay warm with this outdoor heated cat house from Cozy Winters. Two exits help make sure cats won’t get trapped by predators. Check it out. 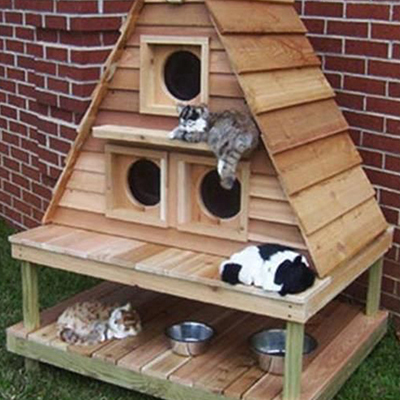 Give feral cats an outdoor shelter—in style! If you’re up for a more serious carpentry project, this A-frame made from recycled pallets will keep feral cats safe from the elements while looking great in your yard. 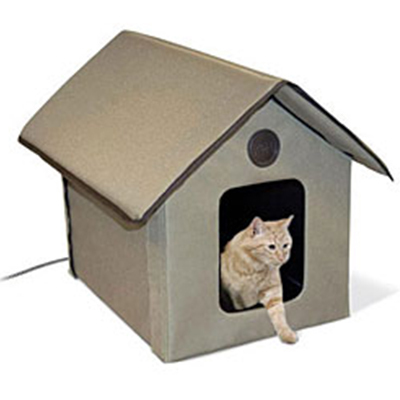 (Note—you’ll have to add insulation to make this shelter suitable for outdoor cats in the winter.) See how on Pinterest. 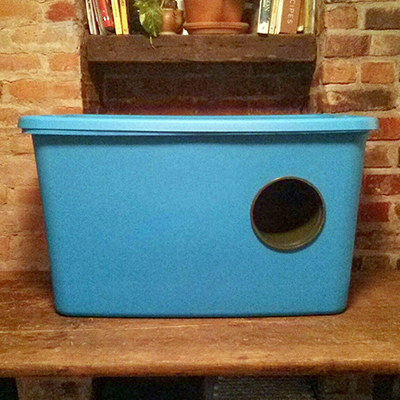 A jumbo-sized clear plastic bin is the foundation for this winter cat shelter. Loaded up with straw for insulation, this shelter will ensure cozy days and nights for your neighborhood feral cats. See how it’s done. 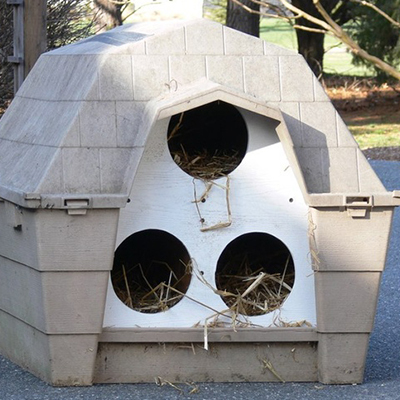 Halfway between a premade and DIY solution, plywood and straw turn this sturdy doghouse into the perfect winter shelter for feral cats. Take a look. 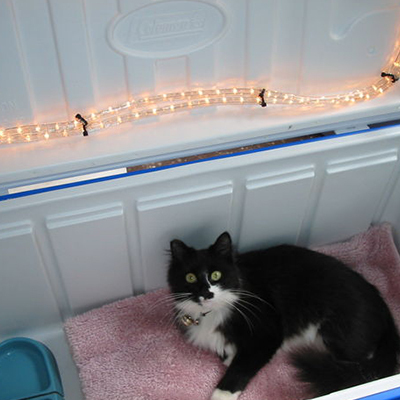 Instead of tossing the cooler in the basement once beach season is over, why not convert it into a winter home for feral cats? (Hint: cat shelter experts suggest using straw instead of blankets for extra warmth and water-resistance.) Get step-by-step instructions. 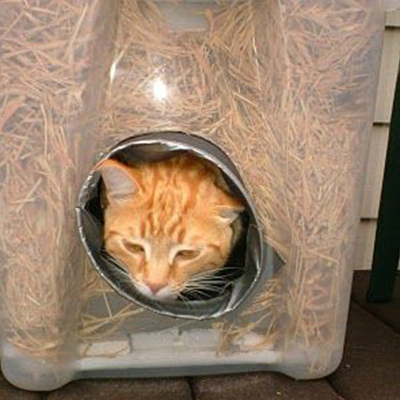 Why not get a winter cat shelter that’s as cute as the cats inside it? The KatKabin is a sturdy, waterproof structure with an insulated floor, best for locations with more mild winters. Check it out. 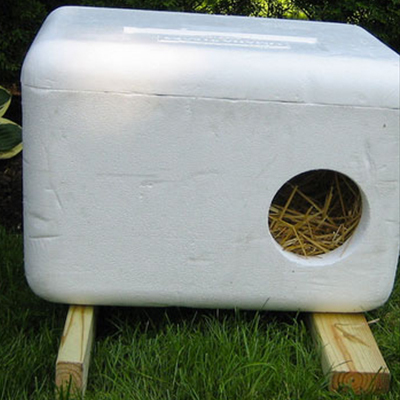 All you need is a Styrofoam cooler, a box cutter, some straw, and a few boards to create this simple, effective feral cat shelter. Ask a local restaurant or medical office to donate a heavy-duty Styrofoam coolers—they usually end up in the trash, anyway. Read all the tips for making it work. 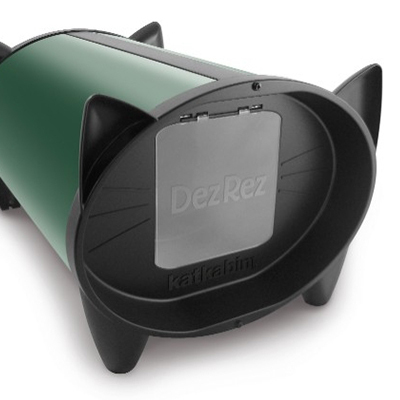 Another option for those looking for a premade feral cat shelter, the Kitty Tube is fully insulated and comes in a “feral option” with straw bedding instead of a standard fabric cat bed. Find it on Amazon. 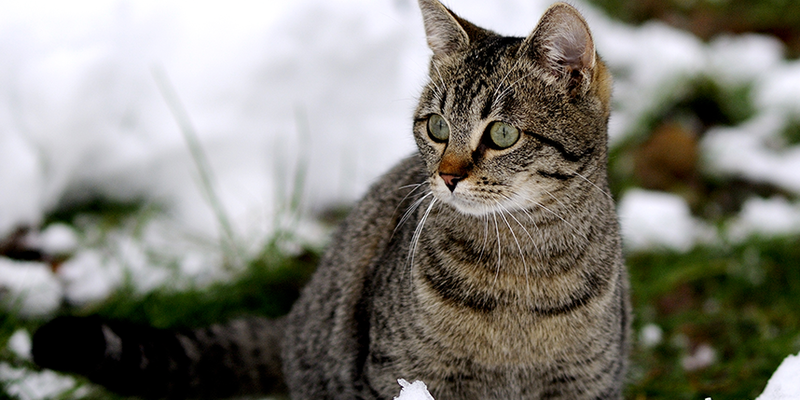 Be sure to place your winter cat shelter in a location that’s protected from dogs and other predators, and keep the entrance clear of snow so cats don’t get trapped inside. And, of course, provide food and water for the feral cats who use your shelter. 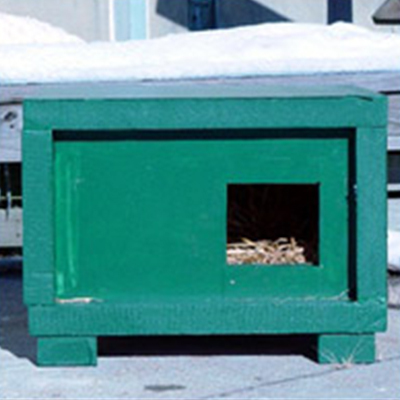 Whether you buy your shelter or make it, feral cats will thank you this winter!